I keep an Apple charging cable plugged into an outlet under my bed where it’s handy for charging my phone or tablet overnight. In the past few months, I’ve had to replace the cable three times. Bad cable? No, bad kitty. It seems that the young male cat we call Cash, who spends a lot of time under the bed, has decided that chewing on thin charging cables is great entertainment. I know it’s him because the failed cables are riddled with tiny teeth marks. But now I have him foiled. I’ve replaced the standard rubbery cable with an Armour Charge cable from Fuse Chicken. 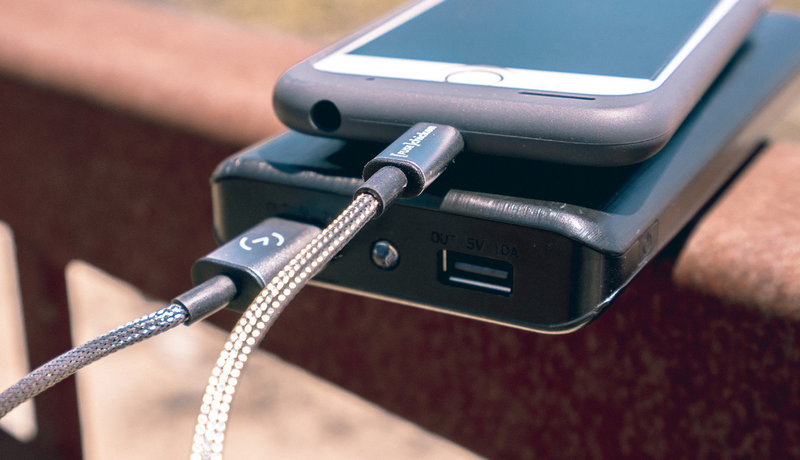 This is no ordinary charging cable. It has shielding made of woven stainless steel strands and the tips are wrapped in aluminum. And the Lightning connector carries Apple’s MFI blessing. The cables are sold on Amazon and on the Fuse Chicken website in two lengths: $34.95 for 1 meter and $44.95 for 2 meters. Those prices are a little higher than what ordinary cables sell for, but I look at it this way: It’s less than what I’ve already spent on charging cables that became cat toys.